Our hotel room in the Hilton Garden Inn featured an amazing nighttime view of New York's iconic Empire State Building. We took some time to walk over and admire the Art Deco lobby. 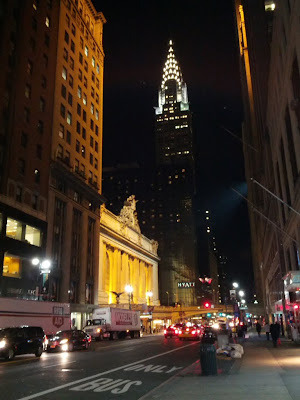 While we were at it, we thought we'd check out the Chrysler Building. It also featured the hallmarks of Art Deco styling. While we couldn't see the Chrysler Building from our hotel, we did get some eye-popping views as we were out and about walking after dark. It's views like these that make New York City so striking to behold.